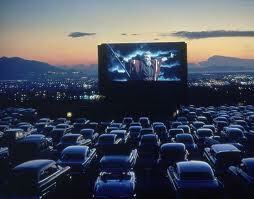 My first memory of having visited a drive-in movie theater is from 1986. My parents loaded us all into the family van and made the trek to a local drive-in theater. The featured films that evening were “Back to School” starring Rodney Dangerfield and “Ferris Bueller’s Day Off” starring Matthew Broderick. You know, Sarah Jessica Parker’s husband. I fondly remember my dad hanging a receiver over the driver’s door in order for us to hear the audio that accompanied the video. The sound was a bit staticky and the screen was a little fuzzy, but not so much that those things ruined the experience. After all, we were enjoying the only technology that existed at the time. Another memory that floods back from that night is how incredibly difficult it was for everyone to get a good view of the screen from inside the van. Portable chairs like the ones that you see at soccer games and outdoor concerts of today hadn’t yet been invented and we didn’t have those bulky lawn chairs that would have allowed us to comfortably enjoy the movies in the great outdoors. Despite the inability to get a clear view of the entire screen from within the van, I have nothing but amazing memories from that evening with my family doing something that was almost unheard of by the mid-80’s as drive-ins were almost a relic. Nearly two decades later, having moved to another state, I was surprised to see that one of my favorite past activities was still available for me to begin making memories for my children. The technology is different, but the experiences are much the same – fantastic! The audio is now played via an FM station in your vehicle, the movie screen is crisp, and the vehicles that we drive are much more comfy than what my parents had. Oh, and camp chairs allow moviegoers to comfortably sit outside of their vehicles for unobstructed views of the screen. The nostalgia of old and comfort of new collided on New Year’s Eve 2011 to create new memories when my 12-year-old daughter and I enjoyed a visit to the local drive-in theater. We missed the company of my husband and teens who all declined to go along on this memory-making, quadruple feature adventure. I think their reluctance had something to do with the first two movies to be shown (Happy Feet 2 and The Muppets). Although this wasn’t our first visit to this drive-in theater, it was the first mother-daughter trip there. We had a great time laughing and talking about silly things in a way that you can’t when “the boys” are around. In wonder, at times mockingly, the youngest (and most adventurous) member of my brood asked questions about and commented on the concession advertisements that played before the first movie. I’ll admit that watching advertisements with a copyright date of 1959 is nothing like the colorful, musical, and noisy pitches that she’s used to seeing on Nickelodeon, and even though I wasn’t born until over a decade after those commercials were made, I found them quite nostalgic and actually enjoyed them. I felt entertained. That experience was the equivalent of enjoying a game on an Atari console having already played one of today’s video game systems. Simply fun and funny! As we reclined in our comfy seats, snuggled into blankets and pillows that we brought from home, we laughed and giggled our way through three movies of the night’s quadruple feature. Right after the third movie of the evening, which starred Sarah Jessica Parker and featured a cameo by Matthew Broderick, a co-owner of the theater announced that it was finally time for us to make our way into the concession area to get our New Year’s Eve treats: hats, noisemakers, and sparkling or hot cider. So my daughter and I made our way through the line picking out each of our items (we chose hot cider, since the outside temperature was 41 degrees) and posed for our picture that was being taken by the same co-owner. What a wonderful evening this had been and it wasn’t over yet! Once back to our van, we eagerly awaited instructions for how to proceed with the celebration. At the appointed time, we were directed to watch the screen as it displayed a decades-old animation counting down to the start of the new year. Alas, shouts of “Happy New Year!” could be heard from every corner of the lot. Honking horns and fireworks marked the momentous occasion. And cups were raised in honor of the promise that the new year would bring. After a few more minutes of celebrating, the final movie of the evening began. We tried to stay awake long enough to enjoy this experience to the fullest, but it just wasn’t in the stars, so we headed home soon after to join the rest of our family and nestle into our warm beds. While streaming video, mail-order video rental subscriptions, ubiquitous video rental kiosks, or local video rental stores (which are becoming relics themselves) are more suitable for the busier lifestyles that we lead today, in my book, they could never hold a candle to the experience of sitting in my own vehicle (or outside of it in a camp chair) with my family while enjoying a great set of movies on a big screen under the stars. The time warp to when life was slower and simpler is the perfect antidote to the toxic schedules that many of us keep. I welcome the experience of taking a step back into time and look forward to future retreats back into the wonder years. The $8 cost per person for 2-4 movies paired with the freedom to bring my own food and drinks into the facility is far less expensive than a family outing at any community megaplex. However, regardless of the cost of admission, the memories that are made from visiting a drive-in theater are priceless. Search the Drive-in theater database to find the closest auto theater near you.